Thanks to the efforts of Asociación Ecosistemas Andinos in Peru, and the Natural History Museum of San Marcos, the Peruvian Postal Service has announced two new postage stamps featuring two of the world’s most endangered birds. 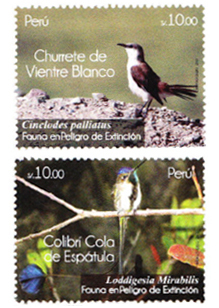 The stamps depict the endangered marvelous spatuletail and the critically endangered white-bellied cinclodes, both known only to live in Peru. The marvelous spatuletail occurs only in the Rio Utcubamba Valley in the Andes of northern Peru, while the white-bellied cinclodes occurs in a few high-altitude bogs in the central part of the country. The photographs used for the stamps were provided to Peru’s Natural History Museum by ECOAN and American Bird Conservancy. ECOAN has been a leader in promoting the conservation of the Marvelous Spatuletail, engaging local communities in establishing a reserve at Huembo and conducting a reforestation campaign to restore spatuletail habitat. ECOAN is also working with local communities and the mining industry to protect the White-bellied Cinclodes at Ticlio along Peru’s central highway. Each stamp will cost 10 nuevos soles, equivalent to about $3.60. Peru possesses an extraordinary ornithological diversity. More than 1800 bird species have been recorded there, ranking Peru the country with the fourth most bird species, behind Indonesia, Colombia, and Brazil. More than 100 species are endemic to Peru, with many more that barely range into neighbouring countries. New species are still being discovered and described from Peru, with several descriptions awaiting publication.